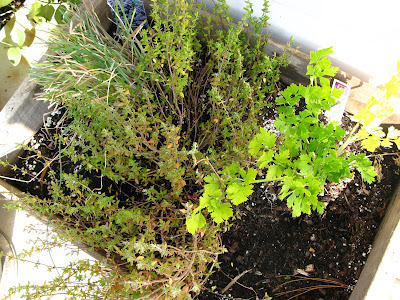 The Un-Official Blog of Romance Author Maddie James: My Backyard Garden - Herbs!!! I'm a virgin herbalist. In late spring, I decided I wanted to grow some garden items in containers on my patio. I've done this before and have been successful with this and that, mostly tomatoes and peppers. But this year I decided to add herbs. Herbs are kind of cool and I love to cook with fresh herbs, so it made sense, right? Of course, I have no clue what I'm doing, so I Googled to get ideas and tips and viola! made it through the entire summer without losing a plant. As far as vegetables I had tomatoes and green peppers and a jalapeño pepper plant. Oh...drat, I lied, because the grape tomatoes just did not do at all. I'll have to research a bit more about growing those. 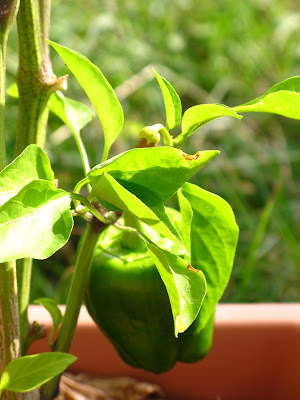 The tomatoes are long gone but a few peppers are still hanging on. I'll let them hang on as long as I can. But we're here to talk about herbs, right? Right. I started off with chives, parsley and thyme and planted them in a wooden box my dad had given me. It was an old flour box, I think, and one my grandparents had. I think they look kind of cool in that box. And I think it was also good growing in there. They seemed to do really well. Then, I went away for a week and the watering was a little sparse, so they got a bit dry...so, I decided perhaps it was time to harvest and dry some for winter. I also have basil. Sweet basil. I love basil! 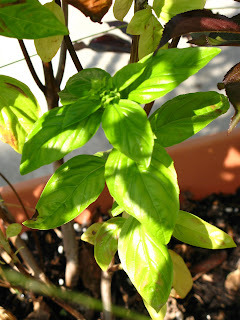 Unfortunately, I didn't know what I was doing with the basil, and it flowered out before I realized it. 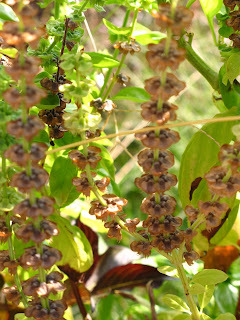 I've heard the best basil comes before it flowers. Still, I've used it off and on. I wonder if you top basil out, pinch the flowers off early -- like you do tobacco when it's in the field -- so it gets fuller and healthier? I betcha. I didn't do that. No, I let my basil go to seed. I'm hoping this container of basil will reseed itself. That remains to be seen. Still, I've harvested a lot of the dried seeds, so I may start some seedlings in the house over the winter. About mid-June, I was out in Albuquerque and spied some herbs outside a small store. We stopped and my friend Sharyl and I bought one each of rosemary and lavender. Believe it or not, I carried these babies home on the plane in my purse. They survived both the plane trip and the summer. I planted them in an old coal bucket. The rosemary is thriving but suddenly the lavender is turning brown. Maybe it's supposed to do that? So, I'll cut it back and dry it out and savor the scent this winter. 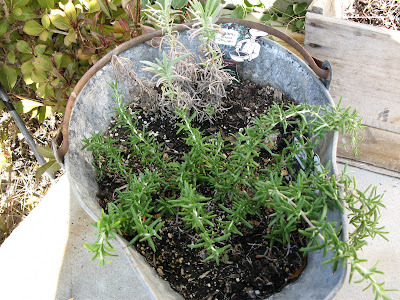 I think I'll bring the rosemary in over the winter, since it came from New Mexico and all. I'm sure it will not like our Kentucky winter. 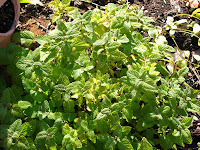 I also have mint and lemon balm. I brought the mint back from Ohio in early summer. There is a bunch of it around the pond on my parents' farm. Dad dug a shovel full, complete with pond scummy soil, and I carried them back to Kentucky in a bucket. I believe that mound of pond soil helped them really take off in this Kentucky clay. See? 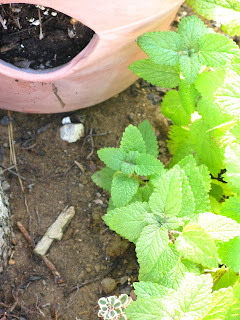 I also planted lemon balm around the tree out back. Of course, it's taking over. 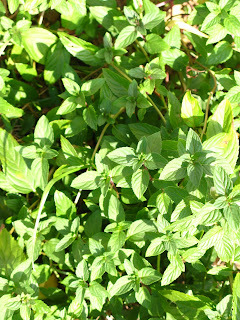 I didn't cut either of the mints back or try to harvest because, well, they are growing nicely and I may have to thin them out later. Or not. Another day, another story. So, this morning after the dew was off, I cut back most of my herbs, brought them inside and washed and laid them out to dry on a towel, and Googled some more about how to preserve them. The thyme and rosemary and lavender, I learned might do best tied in a bunch and hung upside down to dry, then remove the leaves and store. 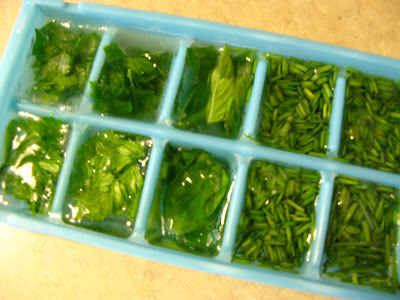 The basil, parsley and chives, do better being frozen. So, I tried that. Here they are in their little cubes. They say you can plop those cubes in a baggie and take out and put in your dish when cooking. Sounds like a good idea to me. So that's my herb story for the day. I guess this winter we'll see how the frozen and the dried herbs, do. Then next summer, I'll be ready.